It is so easy for me to get swept up in buying the season’s latest trends, only for them to go out of style by the next year. It’s time for me to invest in pieces that will stand the test of time, classics that I can wear over and over. These pieces do not come cheap, but then again, good classics never do. It might take you a bit of time to save up for each, but remember you’re saving for great pieces that will truly last. Pearls are classic accessory that should adorn every girl’s neck at one point. I have a beautiful single strand set of pearls given to me by my mom and I love to put them on to instantly class up any outfit. I love throwing a blazer over any dress to give it a bit of class and sophistication. Every time I see a classic trench coat, the Breakfast at Tiffany’s rain scene pops into my head. I have a myriad of pairs of black flats and all I can say is that they go with everything. Have any classic pieces of your own? Share them with me in the comments below! Obsessed with that trench coat! That liittle black dress is super cute, and I've been looking for a good trench. I really want a trench coat! I've also been trying to find a good blazer for the last few years, but I'm tall and have a smaller chest, so it's hard to find one that fits. I won't give up, though! 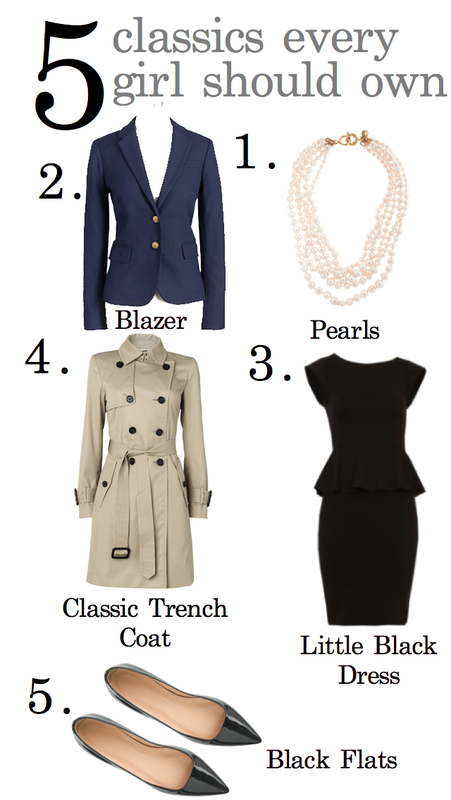 I do agree with these recommendations… I love the blazer. I have a couple which I should wear more often. I have these all and couldn't agree more. I think you also need a cashmere scarf in a neutral color. Agreed – a little black dress is a must! I was just getting nostalgic about summer…but that blazer makes me excited for the cooler temps! I feel SO weird in trench coats (maybe it's the colour that I'm trying on!). But I agree with all the other four things you mentioned!! I just bought my first blazer a few months ago. Black and white striped.. I love it! I love my blazers. They go with EVERYTHING. I feel the same way about trench coats, and feel like everyone should own one! I agree with all of these (minus the flats because I don't think I'll ever own any!) I have so many blazers it's ridiculous! Black flats girl right here! My other half bought me pearls but I never wear them, maybe I should! I think it's great having a capsule wardrobe full of staples like this. Perfect staples! My Little Black Dress is my go to! Yes yes and yes!! Love it!! These are definitely staples for every lady! Thanks for sharing I pinned as well! I agree. It's taken me some time but I have invested in these peices I do need a new trench coat though and black flats but this is spot on! Great list. I just got a good trench coat so I am officially covered on all the must haves. I couldn't agree with your choices more! These are things that never go out of style and look good on whoever wears it. Great choices! I agree! You have great taste! I love all of those items and am already playing with ideas how to personalize them haha! Pearls are on my must have list… I still don't own a set – heck, I think I'd settle for a nice looking fake set! A blazer just seems to pull everything together nicely. Great recommendations you have here. I started investing in Tory Burch flats since I realized that's all I wear. It makes sense instead of throwing $100 at cheaper flats. That trench and those black flats are adorable – I'd love to have them in my closet! I love those classic black flats! I used to wear flats only when I worked in retail but now I work with kids so I wear tennis shoes all day every day and I miss cute shoes! My first crawfish boil. Safe to say, thoroughly enjoyed every little bit. It’s Friday, hooray! Time to jump off that work week merry go round and go enjoy some weekend. Reminder for this week: take some time for myself. It’s either that or I go crazy... one or the other. Oh hey there Spring, didn’t see you there! © Copyright 2019. Brendy Beauty. All Rights Reserved. Designed by Oh Wild.